Free ebook by Richard Stark (aka Donald Westlake). 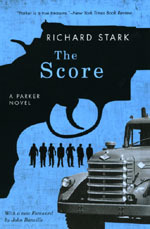 Fans of Donald Westlake, rejoice: University of Chicago Press is offering a free ebook during September of The Score, one of Westlake's Parker novels under the pseudonym Richard Stark. AKA: Five pseudonymous female mystery authors. M. C. Beaton. The lighthearted Beaton mysteries feature dour Scottish constable Hamish MacBeth (adapted for television) and the always-in-trouble Agatha Raisin (adapted for radio with Penelope Keith), but under Beaton's real name, Marion Chesney, other mysteries have appeared (such as the Edwardian-set Snobbery with Violence) as well as romance novels. 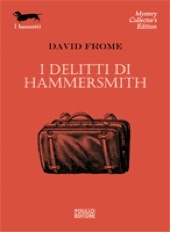 David Frome/Leslie Ford. Zenith Jones Brown began her mystery career with Murder of an Old Man (1929) under the pseudonym David Frome, followed by more than 15 Frome mysteries and more than 30 mysteries under the name Leslie Ford. 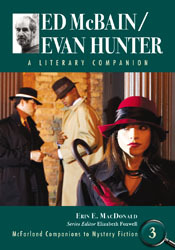 Her sleuths include Mr. Pinkerton, Inspector Bull, Colonel Pickering, and Grace Latham. The bookstore Mystery Loves Company selected Ford's Girl from the Mimosa Club (1957) as one of the best mysteries of the 20th century. Anthony Gilbert. Lucy Beatrice Malleson, a relative of actor Miles Malleson (Kind Hearts and Coronets, etc. ), wrote 32 books under the four pseudonyms of Anne Meredith, J. Kilmeny Keith, Sylvia Denys Hooke, and Lucy Egerton. However, vulgar lawyer Arthur Crook is the star of most of the 60 novels under Malleson's pen name of Anthony Gilbert. Crook debuted in Murder by Experts (1936); the final Gilbert book was A Nice Little Killing (1974). 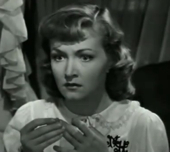 A Detection Club member, she was an Edgar nominee for "Door to a Different World" (EQMM Mar. 1970) and "Fifty Years After" (EQMM Mar. 1973). Evelyn Piper. 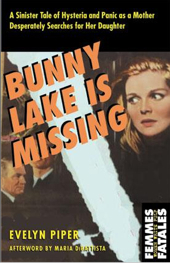 Merriam Modell, wife of a Cornell pharmacology professor, wrote stories for the New Yorker and the novel The Sound of Years (1946), but it was under the name Evelyn Piper that she published her most well-known work: Bunny Lake Is Missing (1957, film 1965). Other Piper books include the Edgar-nominated The Innocent (1949), the Haycraft-Queen Cornerstone work The Motive (1950; called by the New York Times "a fine study in the detection not of who, but of why"), The Plot (1951), The Lady and Her Doctor (1956), Hanno's Doll (1961), The Naked Murderer (1962), The Nanny (1964, film 1965), and The Stand-In (1970). Dell Shannon. Illinois-born author Elizabeth Linington wrote under the pseudonyms Anne Blaisdell, Egan O'Neill, and Leslie Egan, as well as her own name; her police procedurals under the name Dell Shannon feature the LAPD's Luis Mendoza, including the Edgar-nominated novels Case Pending (1960) and Knave of Hearts (1962). Orion reissues Margaret Millar's Beast in View. Happy to see that Orion has just reissued MWA Grand Master Margaret Millar's Edgar-winning Beast in View (1955), as she often has been overshadowed by her famous writer husband, Ross Macdonald. Summed up Anthony Boucher in the Dec. 4, 1955, New York Times re Beast in View: "Devilishly devious trick-plotting given substance by acute and terrifying psychological insight." Stark House Press has republished Millar's An Air that Kills/Do Evil in Return. Happy birthday, Walter B. Gibson. Walter B. Gibson, the man who popularized the crime-fighting Lamont Cranston/The Shadow in the pulp magazines and wrote numerous other works, was born today in Philadelphia in 1897. 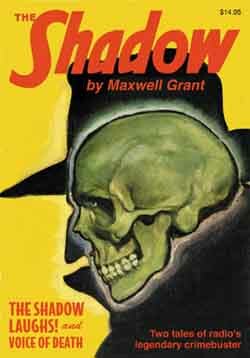 This year marks the 80th anniversary of The Shadow's first appearance in the pulps. Go here to see Gibson discuss the pulp novel; here to listen to the radio program of The Shadow. Ink in their blood: Five female mystery authors from the fourth estate. 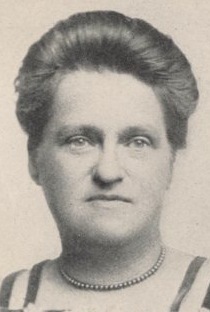 • Edna Buchanan. Miami Herald journalist Buchanan received a Pulitzer Prize for her reporting in 1986 and discussed her coverage of crime in The Corpse Had a Familiar Face (1987) and Never Let Them See You Cry (1992). Her journalist-sleuth Britt Montero appears in Contents under Pressure (1992); the Edgar-nominated Miami, It's Murder (1994); Suitable for Framing (1995); Act of Betrayal (1996); Margin of Error (1997); Garden of Evil (1999); You Only Die Twice (2001); The Ice Maiden (2002); and Love Kills (2007). • Carole Nelson Douglas. As a college senior, Douglas was a finalist in Vogue's Prix de Paris writing competition (along with future fellow mystery novelist Marcia Muller). She was a reporter and feature writer for the St. Paul (MN) Pioneer Press for more than 15 years and received several awards from the Newspaper Guild of the Twin Cities and a second-place award in newswriting from the Minnesota Associated Press. Today, Douglas has a busy mystery writing life, with her Irene Adler, Midnight Louie, and Delilah Street paranormal series. • Gillian Linscott. Linscott was a journalist for the Liverpool Daily Post, the Birmingham Post, the Guardian, and the BBC for nearly 25 years. A versatile writer, she has penned historical mysteries featuring intrepid suffragist Nell Bray (such as the Ellis Peters Historical Dagger winner Absent Friends) and standalones such as The Garden. 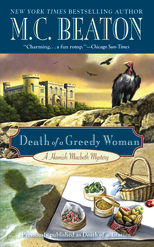 Today, she writes a mystery series set in the Victorian era under the pen name Caro Peacock. • Eve K. Sandstrom. Inspired to pursue journalism by reporter-sleuth Beverly Gray, Sandstrom was a reporter and columnist at the Lawton (OK) Constitution for more than 25 years. 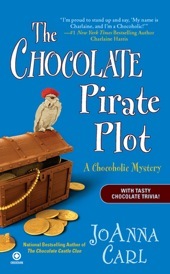 She published several mysteries with Sam and Nicky Titus as well as reporter Nell Matthews, was an Agatha and Anthony nominee for her short story "Bugged" in Malice Domestic 5, and now features chocolatier Lee McKinney in her mysteries under the pen name JoAnna Carl. • Celestine Sibley. A distinguished journalist with the Atlanta Journal-Constitution for more than 50 years (she covered the James Earl Ray trial, among her other assignments), Sibley published her first mystery novel, The Malignant Heart, in 1957, followed by five others with journalist-sleuth Kate Mulcay: Ah, Sweet Mystery (1991); Straight as an Arrow (1992); Dire Happenings at Scratch Ankle (1993); A Plague of Kinfolks (1995); and Spider in the Sink (1997). She died in 1999 and was inducted into the Georgia Writers Hall of Fame in 2007. 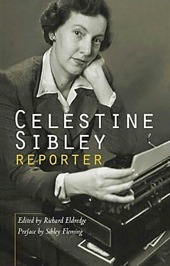 Edgar winner Phillip DePoy adapted her memoir, Turned Funny, into a play in 2006, and Sibley Fleming reflected on her grandmother's life in Celestine Sibley: A Granddaughter's Reminiscence (2000). Now out: E. X. Ferrars companion (ed. Foxwell). Just out is E. X. Ferrars: A Companion to the Mystery Fiction by Gina Macdonald with Elizabeth Sanders. This is volume 2 in the McFarland Companions to Mystery Fiction series that I edit (volume 1 is on John Buchan; the Scots will be pleased that both volumes feature writers of Scottish heritage). 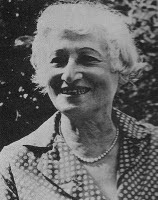 Detection Club member and British Crime Writers Assn cofounder Ferrars published her first book, Turn Single, in 1932, and the last, A Choice of Evils, in 1995. Her sleuths include physiotherapist Virginia Freer and her estranged, often feckless husband Felix and retired professor Andrew Basnett (who often poignantly grapples with the effects of aging). Some of her books are still in print with Langtail Press and Doubleday, and Doug Greene of Crippen and Landru plans a collection of her short stories. Very helpful with the book was Peter Mactaggart, Ferrars's nephew and literary executor, who provided the cover photo, manuscript excerpts (including one from an unpublished novel), and valuable insights on Ferrars's life. Readers may like the handy table that lists Ferrars's methods of murder and the works in which they appear. "We Haven't Seen Her Lately,"
One fascinating aspect was her duel in print with sci-fi writer John Wyndham over the merits of mystery fiction vs. those of sci-fi. Another intriguing discovery was "We Haven't Seen Her Lately," the 1958 Kraft Mystery Theatre production of Ferrars's Always Say Die (see photo), in which a woman investigates her aunt's disappearance amid a slew of shady characters. Shortly before his death, distinguished author-critic H. R. F. Keating, who reviewed Ferrars's Frog in the Throat favorably in the Times, kindly provided a blurb for the back cover. Sadly, Macdonald (coauthor, Scott Turow: A Critical Companion and Shaman or Sherlock? The Native American Detective; author, Robert Ludlum: A Critical Companion) died in September 2010 of leukemia—she worked on this book as she was undergoing medical treatment. Her dedication to this work was inspirational. The lady investigates on BBC Radio 4 Extra. Early female detectives are featured this week on BBC Radio 4 Extra: Loveday Brooke in "The Redhill Sisterhood" by Catherine Louisa Pirkis, Anna Katharine Green's 1915 New York society detective Violet Strange in "The Golden Slipper," and Valeria Woodville in Wilkie Collins's "The Law and the Lady." Episodes can usually be heard online for up to week after broadcast. Barrister and judge Alfred Alexander Gordon Clark, aka mystery author and Detection Club member Cyril Hare, was born today in Surrey in 1900. His best-known sleuth is offbeat lawyer Francis Pettigrew; FaberFinds has reissued many of the Pettigrew novels, including Tragedy at Law, Untimely Death, and When the Wind Blows. 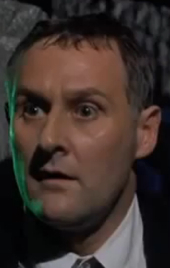 His other detective is Inspector Mallett (Tenant for Death, Death Is No Sportsman, Suicide Excepted). Clark died in 1958. 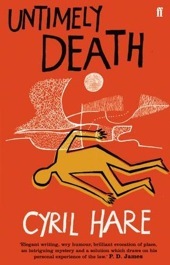 His colleague Michael Gilbert edited Best Detective Stories of Cyril Hare in 1961. Happy birthday, George R. Sims. 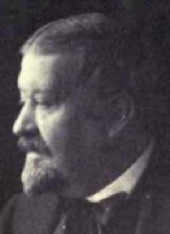 Playwright, poet, writer, bulldog breeder, and bon vivant George R. Sims was born today in London in 1847. In mysterydom, he is best known as the creator of female sleuth Dorcas Dene, who is featured in Dorcas Dene, Detective (1897–98). He frequently wrote about crime, and a reference in My Life, his autobiography, makes it clear that he knew Adam Worth, the master criminal who stole the Gainsborough painting The Duchess of Devonshire. He died in 1922.